Ijen Bromo Madakaripura waterfall, is our tour package which is combine visiting two volcanoes and waterfall near mt.Bromo. This package is 3 days and 2 nights, can be started from Surabaya or Ketapang harbour ( Banyuwangi ). Two paticipants, can go…. # Day 01 : you will be picked up by our staff who is incharge at Kepatang harbour ( Banyuwangi ), then proceed to your chosen hotel near Ijen. Check in, and free program. # Day 02 : early in the morning, accompanied by our staff to starting point ( Patulding area ), passing by coffee plantation. Stop at Patulding area ( parking area ), and prepare your journey to mt.Ijen. Then start the journey by walking for about 3 km to reach the point of view to see the crater. On your way to point of view, you will meet friendly sulfur minner, they are local people who are working there as a minner, they carry sulfur solid stone about 60 up to 100kg on their shoulder, using bamboo basket. Wow, it’s so strong, you can have a chance to take a picture with them. After you reach the point of view, and enjoy the beauty of Ijen crater. Then go back down to Patulding area. Our staff will transfer you to next hotel near Bromo. Check in, and free program. # Day 03 : wake up early in the morning 03.30 AM, then start your journey to first point of view ( mt.Pananjakan ) by 4 wd jeep, to see the sunrise. While you are waiting for sunrise, you can have a drink a cup of coffee or tea at the cantien near the mountain. After enjoying the beauty of su rise, then go to Mt.Bromo by 4 wd jeep, passing by sea of sand. Stop at the Jeep parking are, and start to walk or ride on horse ( optional, personal expense ) to reach the summit of mt.Bromo. Then see the beauty of Bromo crater, then go back to hotel for having a breakfast. 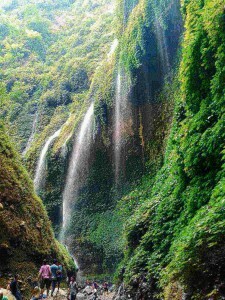 Then check out, our staff will accompany you to next destination, Madakaripura waterfall. Stop at parking area, and start to walk to reach the nearest point of view to see the waterfall. Then go back to parking area, you will be transfer to Surabaya ( hotel, airport or trainstation ). End of service.